To avoid being eaten alive by mosquitoes during the summer months – and exposed to the dangerous diseases they potentially carry – you can be like most people and simply apply a mosquito repellent to your clothes and skin. But a far more effective method of solving your mosquito problems is to cut the blighters off at the source by attacking their breeding grounds with a good mosquito fogger. This indeed is the pest control product of choice among the professionals. These devices work by dispersing insecticide in the form of a cloud of liquid droplets or ‘fog’ over areas where mosquitoes are known to breed and live. But although the concept is relatively simple, mosquito foggers differ greatly in terms of the ingredients they use. In this article, we take a look at the different insecticides used in these products, how they work, and how to choose the best one for you. Read on to find out more. Many of us are unfortunately well acquainted with mosquitoes. 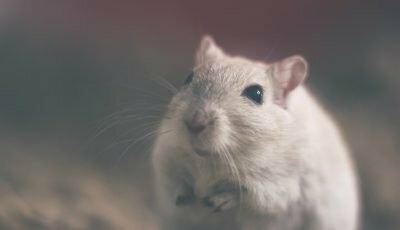 These blood-sucking pests can completely ruin a backyard barbeque, hiking or camping trip, and even find their way into your house, interfering with your ability to enjoy a sound night’s sleep – their constant hovering, buzzing, and irritating, itchy bites are enough to drive even the most patient individuals to the brink of insanity. And that’s not all! Mosquitoes are known to carry some of the world’s most dangerous infectious diseases – including Malaria, Ross River Virus, West Nile River Virus, Dengue Fever, and the Zika virus – which they transmit to us humans as they feed upon our blood. Mosquitoes, indeed, have an almost freakish ability to find homo sapiens – and the human blood that they crave. They are drawn to us by, among other things, the warmth given off by our bodies, and the smell and odor of carbon dioxide and other natural bodily secretions emitted by our skin. Although they have a short lifespan (only 2-3 weeks), mosquitoes breed very quickly; most females of the species will lay many hundred eggs and spawn large numbers of offspring in a very short of time. They require water to reproduce – some potential laying areas for mosquitoes include streams, ponds, creeks, swimming pools, buckets of water or pot plants containing water, bird baths, fish ponds, shrubs, and trees. 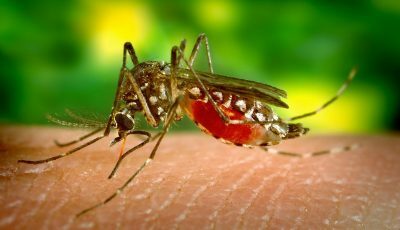 When it comes to protecting ourselves from mosquitoes during the warmer months, most of us think no further than slapping some mosquito repellent onto our skin. Whilst effective enough as a short-term solution, a far more effective way of controlling mosquitoes is to cut them off at the source. Mosquito foggers do precisely that. These devices disperse insecticide over areas that mosquitoes are known to congregate and breed. The insecticide comes in the form of a mist or ‘fog’ of small droplets of the chemical. The mosquitoes that come in contact with the poisonous insecticide are killed outright, and often instantly. Foggers can discharge their contents directly onto foliage and lawn, or your home’s indoor surfaces or they can be sprayed into the air and land on those surfaces indirectly. As mosquitoes are most active during the periods of early morning and in the late afternoon, fogging is most effective when conducted at these times. Foggers are the devices of choice for pest control professionals tasked with regulating mosquito populations. There are actually two different types of mosquito foggers, Thermal, and Electric mosquito foggers. Thermal foggers make use of heating coils that convert an insecticide from a liquid into a mist or fog. They are ideal for using them in outdoor areas like large yards, patios etc. These devices are capable of operating on a small butane gas cylinder and are thus very portable and versatile. But be sure not to use in enclosed spaces, due to the risk of asphyxiation! Electrical foggers, on the other hand, run on electricity, which they use to transform the fogging liquid into a fine mist that is then dispersed into the surrounding air. Whether thermal or electrical, mosquito foggers make use of mosquito control insecticides. 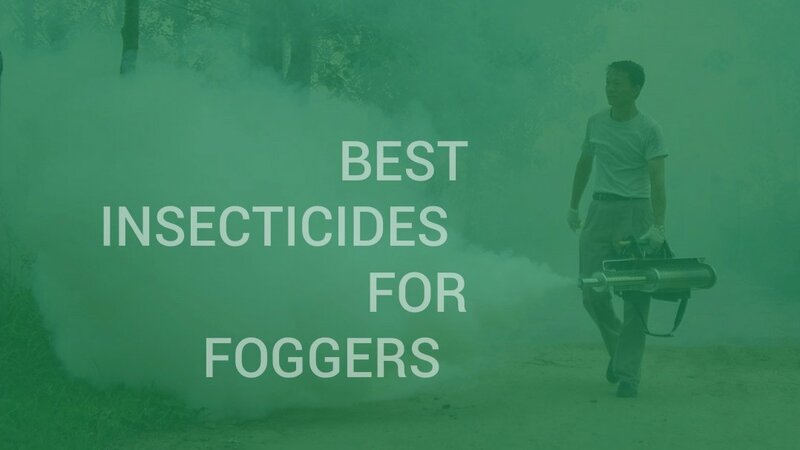 There are many different types of insecticide on the market, and quality foggers tend to be compatible with most of them. A lot of these products can be purchased at home and garden stores, and although prices vary considerably, most of them should be pretty affordable to the average householder. Generally speaking, these chemicals can be divided into two types: residual chemicals and non-residual chemicals. Due to the chemical residue they leave, residual chemicals are not recommended for use outdoors due to the effect they have on other wildlife. They may be more suited to indoor applications. For outdoor applications, you should be looking at non-residual pesticides. Fogging with these chemicals is much like going over your garden with a very large can of mosquito spray. With a mosquito fogger, you can apply this type of insecticide to large stretches of the mosquito-infested area, including foliage, lawns, and gardens – or spray directly into the air. Unlike residual chemicals, non-residual insecticides have a much shorter half-life, ie their potency rapidly decreases after application resulting in a much-reduced impact on other wildlife. When applied directly to foliage or lawn, the insecticide will continue to work for a number of days before it is broken down (particularly by rain). When released into the air, it is usually only effective for a few hours before it dissipates and becomes too diffuse to be effective. Malathion: this is an organophosphate that is often used as a crop-spraying insecticide, though it is also commonly used in mosquito fogging devices. You can spray it directly on vegetation, like the bushes where mosquitoes are known to dwell or use it in a 5 percent solution for fogging your yard. Permethrin – permethrin is one among a number of chemicals known as pyrethroids, a synthetic replica of a naturally occurring insecticide found in certain species of the chrysanthemum flower. Generally mixed with oil or with water and applied as a mist, permethrin kills the mosquitoes by interfering with the central nervous system of the creatures (this is how malathion works as well). Both of these ingredients are powerful insecticides, and can also be toxic to fish and small birds (something to bear in mind if you care about the other fauna in your yard). But they are generally safe for humans when applied in the quantities used to control mosquitoes. Permethrin is probably a more eco-friendly ingredient that malathion. There you have it then! Mosquito fogger insecticides are an excellent and efficient means of turning your yard into an insect-free zone – now let’s take a look at what in our view are the best products of this kind out there today. One of the most used insecticides for mosquito foggers is this Black flag fogging insecticide because it was created just for this purpose – to use to get rid of pests like mosquitoes, biting flies, and other annoying insects. 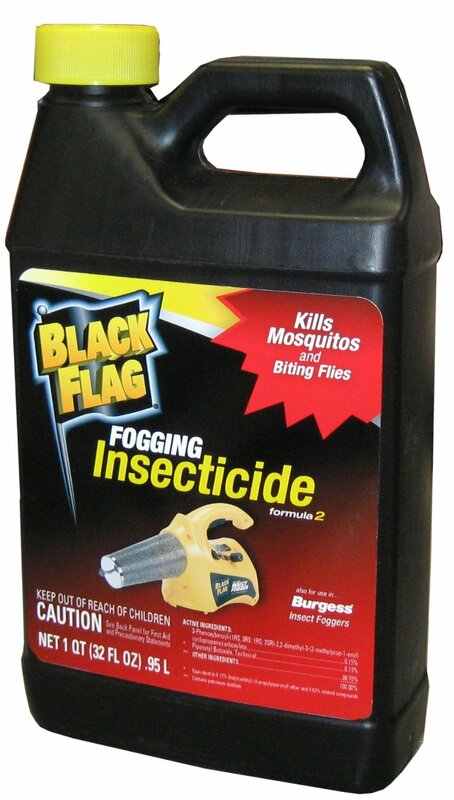 The manufacturer of this fogging insecticide is Fountainhead Group, Inc. who is behind brands like Black Flag, Burgess, Smith, and others. And they specialize in not only different sprayers but also foggers and insecticides which makes them more than qualified to produce this mosquito fogger liquid, too. This particular fogger insecticide contains two main active ingredients – d-Phenothrin and Piperonyl Butoxide – and both of them offer different benefits. The 3-Phenoxybenzyl-(1RS, 3RS; 1RS, 3SR)-2,2-dimethyl-3-(2-methylprop-1-enyl) cyclopropanecarboxylate or d-Phenothrin for short is an insecticide that is capable to control wide variety of insects by disrupting their nervous system function, but the Piperonyl Butoxide is a synergist meaning that this chemical enhances the insecticide properties and lets it work more efficiently. The fog that is created using this insecticide will be able to penetrate even the thickest of foliage and get into even the smallest of cracks killing the mosquitoes upon contact making the whole fogged area free of mosquitoes. Then after the fogged area is dried which usually takes only about 5 minutes, the insecticide will keep working about 6 hours and more if you have used the insecticide on the area before, letting you enjoy outdoors area without the interruption from mosquitoes. On top of that, you will only need about 1.5 ounces of the mosquito poison and about 2 minutes time for every 1000 square feet so the fogging will be quick and you will be able to do it even if you are in a time crunch. And the fog won’t leave any odor or residue so nobody will be able to tell that you fogged your area, they will just be able to see mosquito-free space. Leaves no odor or residue, so you won’t even be able to tell that your outdoors area have been treated with this best insecticide. Can be used only in outdoor spaces, so won’t be useful to those, who need an insecticide for indoors usage. 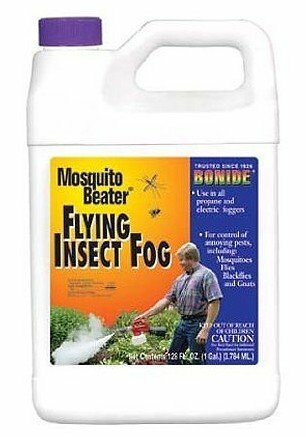 Another similar ready-to-use fogger insecticide that will be efficient at combating mosquitoes and freeing your area from them is this Bonide 553 flying insect fog insecticide that is manufactured by Bonide Products, Inc. who are professionals in different fogging insecticide and spray and fogger manufacturing with 90 years of experience. This mosquito beater fogging insecticide is a superb product to use outdoors as lawn insecticide and fogger liquid for trees, bushes, and even garden. It contains two common active ingredients d-Phenothrin and Piperonyl Butoxide which are insecticide and synergist respectively meaning that the first substance will kill mosquitoes interrupting their nervous system function, but the second one works as an enhancer for the first substance so it is able to be even better insect killer. Additionally to those two active ingredients the fog that will come out of the fogger when this mosquito fogger liquid is used will be thick and powerful, killing all mosquitoes, gnats and flies upon contact, but it will dissipate quickly, letting you fog the area you need to have free of mosquitoes even minutes before you want to use it and then once the area is dry use it for picnics, BBQ’s, parties or any other outdoors event. And this fogging insecticide doesn’t require mixing or measuring, as it comes in a ready-made formula, letting you just pour it in your fogger, turn it on and fog your desired area. Made by a manufacturer with years of experience in insecticide production. The effect of this insecticide last up to 6 hours, so won’t be the best, if you need your area 100% mosquito free for more than that. Target pests: Mosquitoes, fleas, ticks, ants, spider mites, worms, etc. A veterinary approved insecticide that is great at not only repelling mosquitoes and other flying insects but also pests like ticks and fleas, so your pets can get rid of them easier, is this Vet-Kem fogger insecticide. The manufacturer for this insecticide like you can guess is a company called Vet-Kem, who for more than 25 years now have been producing different insect control products so you and your pets can be protected from insects and pests. 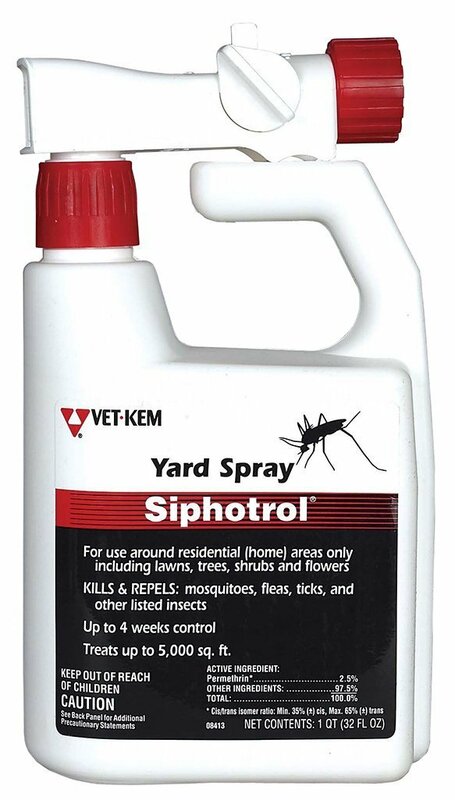 This mosquito poison works with the help of permethrin which is the active ingredient of this insecticide. Permethrin is a pyrethroid family insecticide which means that it works by affecting the nervous system of the insects, causing them paralysis and later death. Which is why it is the insecticide that is often used in most mosquito control programs because it ensures that the mosquitoes are killed on the spot. And because this insecticide contains 2.5% of Permethrin, the fogging insecticide is capable to kill everything from mosquitoes to crickets to beetles and keep doing it for 4 weeks after it is applied, but it won’t be harmful to humans as well as pets after it is dry ensuring that your area is pest but not pet free. 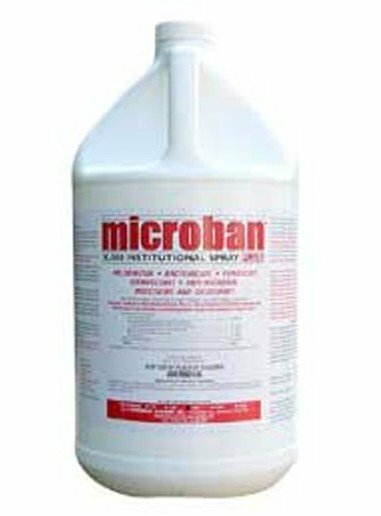 On top of that, because the solution is in ready-to-use form, with the 32-ounce bottle you will be able to treat an area that is up to 5,000 square feet. And you can use this product with either the applicator that comes with the bottle, or pour it into ULV fogger and apply this best insecticide tittle worthy solution that way, because either way it will get the job done and will rid your outdoors space be it your lawn, outdoors of buildings or backyard from mosquitoes. The 32 oz bottle will be capable of treating 5,000 square feet area. If you need to treat area bigger than 5,000 square feet then one bottle of this solution won’t be enough. Target pests: Mosquitoes, fleas, ticks, etc. 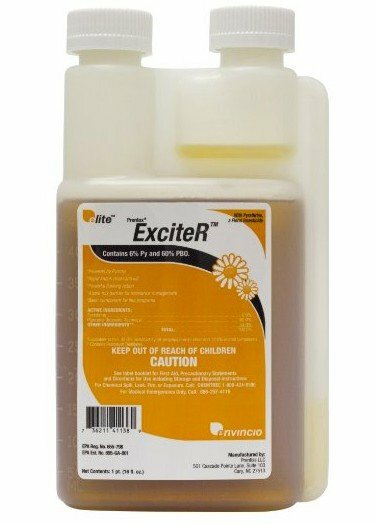 A fogging insecticide that you will have to dilute with water but that will last for several weeks fending off insects like mosquitoes, ticks, flies and so on is this ExciteR pest control insecticide. It is made by a company called Envincio, LLC, who manufacture many different form pest control products from granules to liquids. The two active ingredients that make this fogger insecticide special are Pyrethrins and Piperonyl Butoxide that together makes a combination that is deadly to mosquitoes. The Pyrethrins that make up 6% of all ExciteR insecticide solution are pesticides that are made up from 6 chemicals that are especially toxic to insects because they excite the nervous system of insects causing the paralysis and death. But Piperonyl Butoxide is an additional chemical that is often put into insecticides and pesticides to help them work even better and quicker. And since 60% of all this fogging insecticide is Piperonyl Butoxide, it is able to not only kill mosquitoes and other insects upon contact but also remain in the fogged area and be efficient for at least a month. 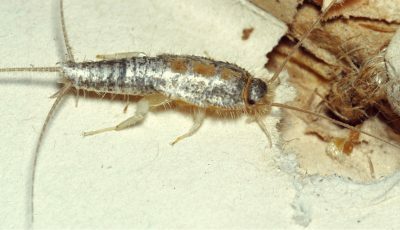 If this insecticide is used right – the proper amount of the insecticide concentrate is diluted with the proper amount of water – it won’t leave any distinct residue or smell, but you will need a small amount of the insecticide to cover fairly large area and to kill all the unwanted pests in it. And you can use either a pump sprayer or a fogger with this insecticide, and both will give you great results in terms of how well they will cover the area and how efficient the output spray or fog will be in killing insects. The insecticide kills mosquitoes upon contact, so no insect will be left after the fogging. This insecticide comes in concentrate form, so you will have to dilute it with water before use. 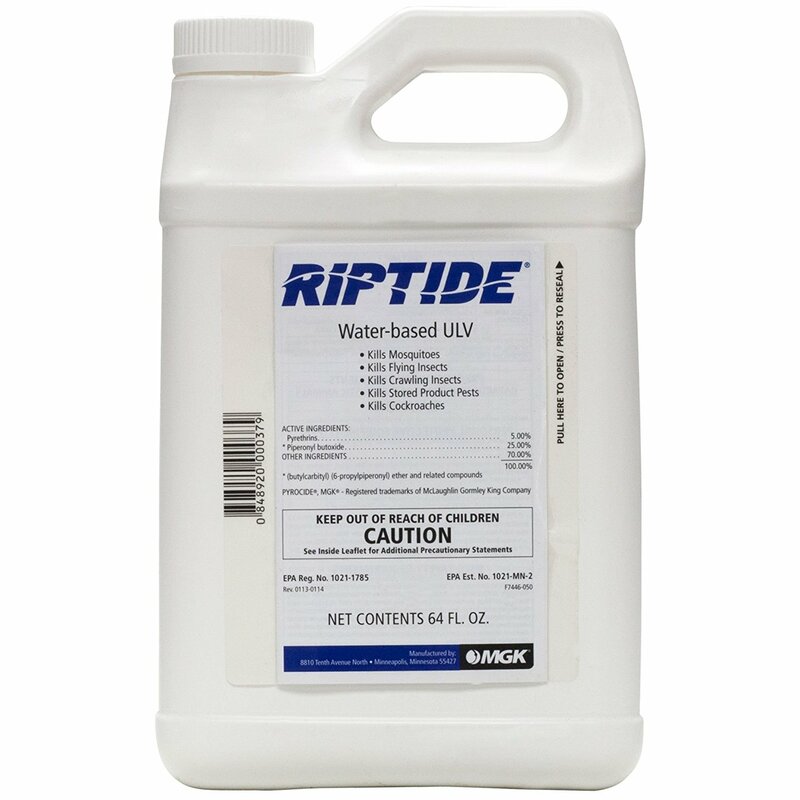 Another thermal fogging insecticide that can be used with an Ultra-Low Volume (ULV) mosquito fogger or mosquito misting systems is this Riptide insecticide which serves as great mosquito poison. It is produced by a company by the name of McLaughlin Gormley King Company, who is one of the main chemical distributors in the United States, making many different chemical related products including fogger insecticide. What makes this particular insecticide so great is the two active ingredients that are part of this solution. They are Permethrins and Piperonyl Butoxide. The former one is chemical that commonly is used in insecticides, because of its neurotoxin like properties – ability to disturb the insect nervous system paralyzing and then killing them. But the latter one is an organic compound that enhances the effects of Permethrin by making it more potent. And because this Kontrol insecticide consists of 4.6% Permethrin and 4.6% Piperonyl Butoxide it will be efficient enough to kill all kinds of insects from mosquitoes to gnats to flies killing them as soon as they come in contact with the chemical. Because this liquid is a concentrate it will have to be diluted with water, before using it with any ULV fogger because otherwise, it will be too potent. However, that also means that you will get more out of the 64 fluid ounce jug. This mosquito fogger liquid isn’t corrosive so it won’t damage cars, trucks or any other structures that it might come in contact with and it doesn’t leave residue or odor, which means that you will be able to re-enter the treated area after it has been dried and it will be safe to use even by children and pets. After you have fogged your area and it is dry, you and your pets are safe to enter it, without having to worry about any health problems. It is not organic, so might cause some allergic reaction to those who are extra sensitive to chemicals. Target pests: Mosquitoes, biting flies, etc. If you need a mosquito fogger liquid that is ready-to-use upon purchasing and that will deliver great results for several hours then you might want to look into this Repel fogging insecticide that is manufactured by Minneapolis based McLaughlin Gormley King Company or MGK for short but distributed by previously mentioned The Fountainhead Group, Inc.
Because it is similar formulation to already mentioned Black Flag fogger insecticide, this best insecticide, too, have two main active ingredients – d-Phenothrin, Piperonyl Butoxide – where the first will act as a neurotoxin affecting the insect nervous system and killing them that way, but the second will act as an enhancer for d-Phenothrin to help it be more potent and therefore more efficient. But since both of these substances makes up only 0.15% of the whole solution each, then they although are able to kill most insects, won’t be harmful to humans or pets. The insecticide will remain working for about 6 hours after application, which can seem not a long time for some, however, if you reapply the fogging solution multiple times it will remain effective for longer. And since the solution isn’t as potent as some in this list of best fogger insecticides, you will be able to re-enter the treated area less than 5 minutes after fogging and you will be completely fine. 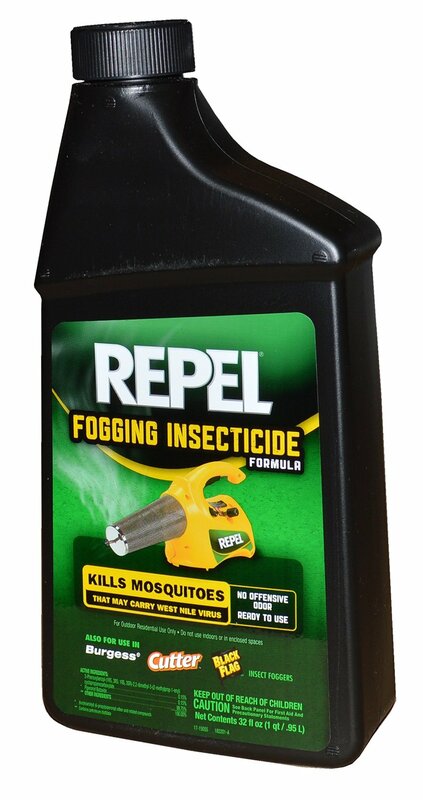 Moreover, you won’t need to mix this mosquito poison with water making it easier to use, and it won’t leave residue or any smell in the treated area, so you will get to enjoy your outdoors mosquito free area right after you have fogged it with this Repel fogging insecticide. Both active ingredients in this insecticide are strong enough to kill insects, but not potent enough to harm humans and pets. Lasts only about 6 hours, so it won’t be as good for longer parties or events. Target pests: Mosquitoes, fire ants, beetles, leafminers, Colorado potato beetles, etc. A very interesting product is this Monterey Garden lawn insecticide by Monterey Lawn & Garden Products because it is not only an efficient mosquito poison but also will fight different garden pests that can harm your garden and limit your yield. Since this is a Spinosad insecticide, it can be labeled as organic fogging insecticide. Spinosad insecticide implies that it contains spinosad which is a natural substance that is made by a bacterium found in soil, and although it is organic, it is extremely toxic to most insects, including mosquitoes, ants, spider mites and so on. But it doesn’t stop there, because Spinosad also is able to kill pests like leaf miners, different caterpillars and other common garden bugs and even broadleaf weeds, it will be perfect to use not only in your backyard but also in your garden and on your fruit trees, so once autumn comes you can enjoy the fruits and vegetables you grew during the summer to their full potential. The great thing about this particular product besides that it is organic and still so efficient is that it also doesn’t leave any odor or residue on the fogged area so you won’t notice the spinosad insecticide working, but it will still act fast and continue doing it for several days or even a couple of weeks depending on how often you have treated your area with this insecticide. And this insecticide could be considered as the best insecticide for people with gardens because it won’t be toxic to you, your pets or most beneficial insects like bees, letting you get rid of only the pests that bother you. This insecticide is able to get rid of mosquitoes, different beetles and other pests that target gardens and fruit trees as well as broadleaf weeds, so your backyard, garden, and other areas can be bug and weed-free. The insecticide needs to be diluted with water before use, which is an inconvenience for some. Target pests: Mosquitoes, ants, fleas, ticks, etc. Another organic product that will be totally safe for you and everyone around you except pests like mosquitoes, fleas, ticks, ants, is this Natural Yard spray by Wondercide Natural products, who manufacture completely natural pest control products, that won’t cause you or your pets any health damage, but that will still be as efficient as their chemical competitors at combating different pests, killing them upon contact and afterwards repelling them from coming into your area. This fogging insecticide works thanks to its natural active ingredient – cedar oil, and it is efficient, because it affects octopamine in so-called bad bugs, which is responsible for regulating the heart rate, movements as well as behavior of pests, blocking the neurotransmitter receptors of it and causing the pests that do come in contact with the cedar oik to suffocate and later die, but others – to not want to come close to the treated area, so efficiently repelling them. The two main pests that this insecticide is meant to kill are ticks and fleas, however, it is more than capable to also kill and repel mosquitoes, ants, roaches and even venomous snakes and scorpions proving to be a big help in your yard, garden, lawn and other outdoor areas. Because this solution is a concentrate you will be able to treat a twice as large area with it because the 1-gallon jug is measured to treat approximately 84,000 square feet large area. And the effects will last 7 to 10 days after first few foggings and about 30 t0 45 days after you have already established control and disrupted insect breeding cycles. So deal with insects in your outdoor areas the natural way by using this natural and best insecticide from Wondercide Natural Products. It can be applied using various different applicators, including mosquito foggers. It is meant for outdoor use only. Target pests: Mosquitoes, flies, bedbugs, fleas, etc. 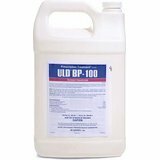 One of the rare fogger insecticides that can be used outdoors and indoors is this BP-100 fogging chemical that is manufactured by BASF Pest Control Solutions, a company that creates different pest management solutions for professionals as well as amateur users, so everyone can enjoy pest free home and yard. The three main active ingredients that make this particular best insecticide so efficient and so good are Pyrethrins, Piperonyl Butoxide and MGK 264 where the first one is pesticide that is extremely toxic to insects like mosquitoes, moths, ants, etc., the second is an organic compound that boosts the efficiency of Pyrethrins making them act quicker and be even more deadly to insects, but the third is a common pesticide ingredient that also boosts potency of pyrethroid type ingredients. And because the whole solution consists of 1% Pyrethrins, 2% Piperonyl Butoxide and 2.94% of MGK 264, it is potent enough to continue working 2 to 3 weeks after it is applied, but won’t be toxic to humans or pets once it has dried, making it safe to use in your home or any other common use areas. This solution is safe to use in your backyard, garden, and other outdoor areas as well as indoors around your house and even in food handling areas like the kitchen because these areas often are full of pests, and this insecticide will help you get rid of them. And the gallon jug will last you a long time, so you won’t have to go to the store and buy a new bottle of this insecticide every 3 weeks or so. It is nontoxic to humans and pests so can be used around food handling areas. The fogged area can be used only after 1 to 2 hours after the area is dry. Target pests: mosquitoes, flies, bedbugs, fleas, roaches, etc. And last but not least in this list where I gathered all of the best fogger insecticides, is this ProRestore Microban insecticide, which is a systemic insecticide and meant not only to kill insects but also for multiple other uses, making it unique and very versatile. Because this insecticide not only kills pests but also is able to kill fungi, bacteria as well as different smells and odors, you can call it an insecticide, fungicide, bactericide, and deodorant all in one. And one mosquito fogger liquid is able to be all of these things only thanks to the active ingredients that the manufacturer of it – Pro Restore – have put in it. There are four of them: o-Phenylphenol, Benzethonium chloride, N-octyl bicycloheptene dicarboximide, Piperonyl butoxide, d-trans-Allethrin. The first one is an organic compound that is an efficient agricultural fungicide, the second is an antiseptic that is able to fight not only fungi but also bacteria and mold, the third ingredient is commonly known as MGK 264 and is a booster to make pyrethroid family ingredients more efficient, and the fourth is a pyrethroid compound that is commonly used in insecticides, more importantly solutions meant for ULV foggers, and efficiently kill pests by paralyzing them and afterwards causing death. So you can use this liquid mosquito poison to kill not only unwanted insects and pests but also fungi, mold and many other unpleasant things that are common to outdoors and indoors areas. After you have treated the designated area, you should wait 20 to 30 minutes for the solution to dry and start working, and then you can reenter the area and use it as before. And effects will last up to even 6 months, which means that you will have to apply this insecticide only about twice a year to live an insect, fungi, mold and bad odor free life. All the active ingredients are chemical, so this is not an organic insecticide. If you need an insecticide for your thermal mosquito fogger or ULV fogger, that will efficiently kill pests like mosquitoes, ants, flies, fleas and other insects, then this list of the greatest insecticides is meant just for you. Each and every one of these solutions are worthy of the title best insecticide, so if you need a fogger insecticide that is efficient, safe and reliable then all of those listed in this article will fit your needs. What are things you should not run through a ULV fogger. I know a lot of people with broad mites, and like to use organic products like Nuke Em, Azamax, Neem, and various essential oils, with a wetting agent. To know what type of solutions you can use with your ULV fogger, you should look at the label for your particular fogger and check if the fogger can be used with oil based solutions, water based solutions or both. And then you can find a suitable solution (oil or water based one), that will not only help you get rid of your pest problem, but that will also be organic. Which one would be safe to use around horses? Experts say, that insecticides in the pyrethrin family (allethrin, resmethrin, permethrin, cyfluthrin, esfenvalerate, bifenthrin, Cyfluthrin and such) are the safest for horses. Fallowed by Carbaryl based insecticides. And that you should make sure to avoid organophosphorus insecticide family (insecticides containing malathion, parathion, diazinon, fenthion, dichlorvos, chlorpyrifos, ethion, trichlorfon). So from this list I would go with the Vet Kem Pest Control Spray. However, some of the others on the list also could work. The key is to check the label of the insecticide you want to use and make sure that it says that it is safe to use around animals and that you know how to use the insecticide. You can use most of the products in this article, because they are great mosquito killers and won’t be harmful to fish. Although, in general, we usually tell people to avoid spraying the insecticide around water-bodies, and use products like mosquito dunks instead, because the dunks are specially designed to kill mosquito larvae in water but not to harm other wildlife. I am sorry if this sounds redundant but i have a black flag thermal fogger and i know their solution is oil based. But i am looking for a solution i can use in a thermal fogger that will last longer than 6 hrs. I know you have stated some in your article but was unsure if when you used the term fogger that meant thermal fogger or all foggers? No worries. I know for a fact that you can use the Black Flag insecticide, the BONIDE Flying Insect Fog, the ExciteR 6% Pyrethrin Pest Control insecticide, the Kontrol 4-4 Mosquito Fogger Chemical, the Repel Fogging Insecticide, the Wondercide Natural yard spray, and the BP 100 Pyrethrin Fogging insecticide with a thermal fogger. Are there any of these that are best for biting midges but won’t harm bees? 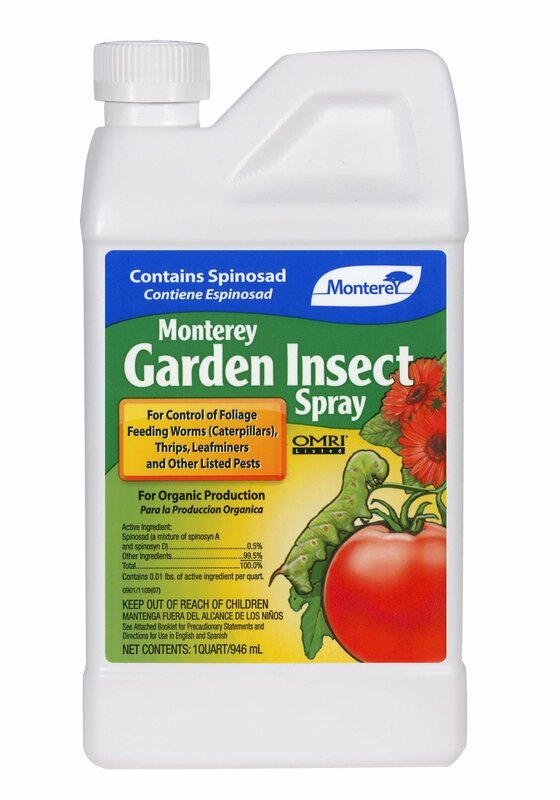 I would suggest you to try the Monterey Garden Insect Spray Concentrate, because it is organic and therefore won’t harm beneficial insects like bees, but it will kill mosquitoes, midges and any other unwelcome pests. wondering if there is an actual store where these products are sold – in the Ottawa or Toronto area….. I am not sure, as I am not from this area. But I would suggest you to check out your local hardware stores, like Lowe’s and such. Hi Karen, I am debating between Kontrol 4-4 Mosquito fogger and the BP 100 Pyrethrin Fogging insecticide. Which one is more effective, aggressive and long lasting to treat mosquitoes, chiggers, and some ants? The Kontrol 4-4 insecticide is a bit more potent and therefore will be more aggressive since it contains 4.6% Permethrin and Piperonyl Butoxide versus the 2.0% Piperonyl Butoxide, 1.0% Pyrethrins and 2.94% MGK 264 that the BP on contains. I am ordering a propane fogger to fog the inside of my chicken coop. The mosquitoes seem to like to hang out in there. Is there a good organic solution that won’t harm my birds that can be applied with the fogged? 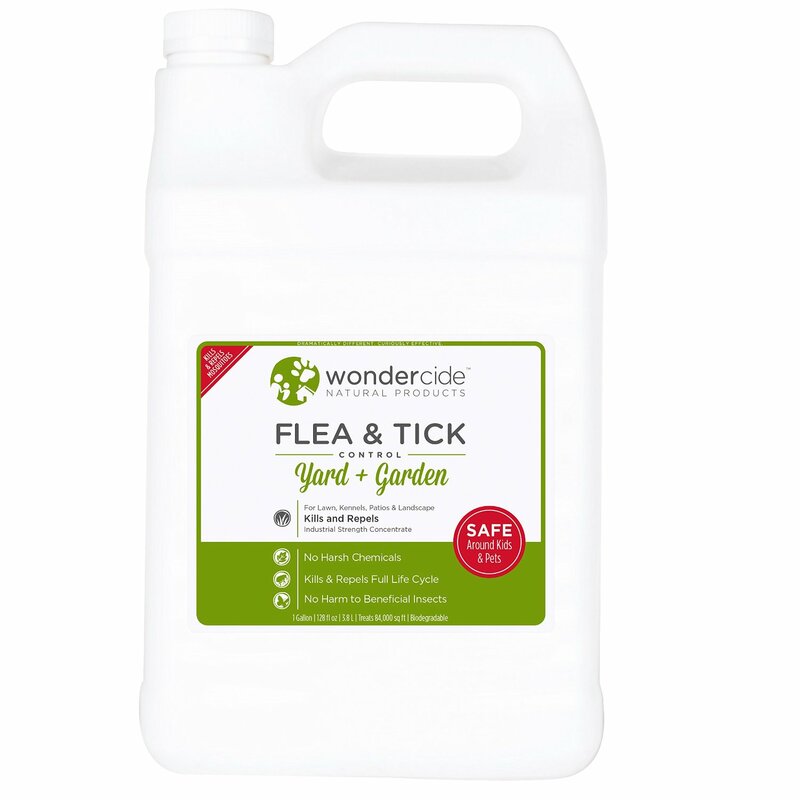 The most natural insecticide from all those listed in this article is the Wondercide Natural Flea and Tick Yard Spray Concentrate. The active ingredient for this one is Cedar oil, which is completely organic and natural. However, know that some say that cedar oil is bad for chickens since they have very sensitive respiratory systems and large concentrations of cedar oil can cause health problems. While others say it is totally okay to use cedar oil in chicken coops as long as you properly ventilate the coop before letting your birds back in it. So I’d recommend you do your own research on cedar oil before using it in your chicken coop.